This September, we are very excited to have Layla Amber as our featured artist. Layla is one of our most popular jewellers whose cute and quirky designs have become long-time favourites at cambridge contemporary crafts. Throughout the year, you can always find some of Layla’s lovely pieces on our jewellery shelves or tables. This month, for the first time ever, we will be creating a window display with her work. Layla is designing some brand new things to go in our front window, including floral wall pieces. We can’t wait to see what she has in store for us! Layla Amber is a designer/maker based in a beautiful seaside town in Suffolk. She was brought up in a very creative family with her mother and grandfather both being artists. Layla studied Graphic Design at the Norwich University College of the Arts, graduating in 2010 with a BA honours. It was during her time at art school that Layla discovered her passion for illustration. When she graduated, she set out to turn some of her illustrations into jewellery. Layla started working from a corner of her bedroom and now has her own studio, supplying jewellery to galleries and boutiques all over the world. We’re very proud to be one of them! Layla's aim is to create fun and wearable pieces of jewellery from her finely detailed illustrations. She started out working mainly in shrink plastic, a material that allowed her illustrations to retain their intricacy and vibrancy in a miniature format. 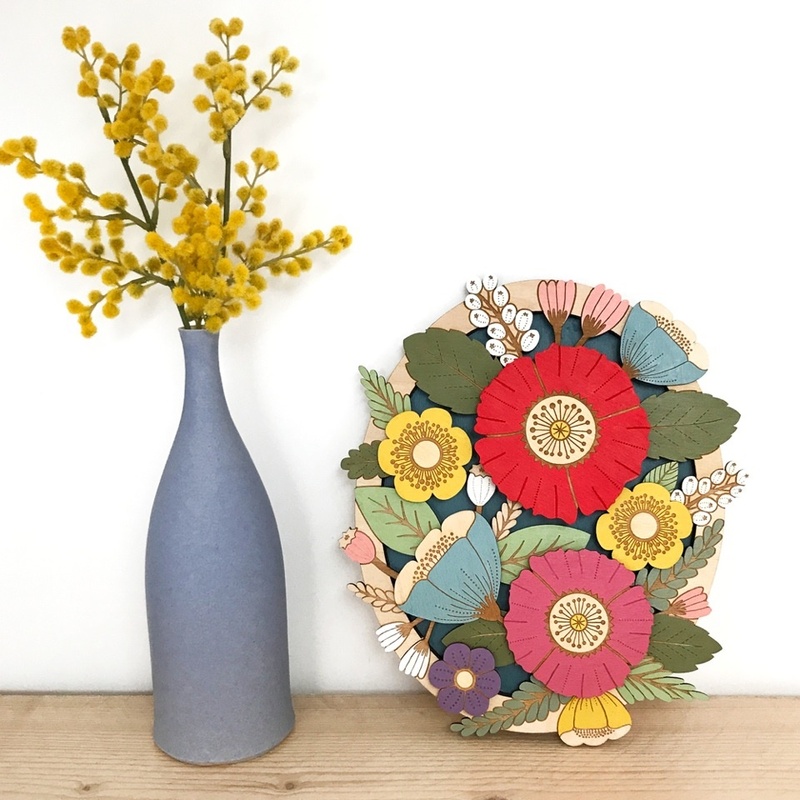 Her design style evolved over the years and she now focuses on more illustrative designs intricately laser cut in sustainable birch wood and then delicately hand painted. She likes to think of them as miniature wearable pieces of art. Layla’s work is greatly inspired by wildlife and the seasonal changes of the countryside that surrounds her. This free exhibition runs from 2nd – 20th September 2017. We are open Monday to Saturday from 10am to 5.30pm and Sunday from 11am to 5pm.